It was a must win game against a struggling Garden Spot who has not had a victory over the Pioneers since 2008. With a win Lampeter-Strasburg would be in a great position in the Lancaster-Lebanon League as the season's end approaches. But alas it was not to be as a Garden Spot touchdown with 42 seconds left in the game gave the Spartans an upset win, 42-36. But Garden Spot drove down the field and tied it at seven with 39 seconds left in the first quarter. The second quarter was not the same story. Garden Spot put up 22 points in the second quarter, with L-S only adding 7. At halftime, the Spartans lead 29-14. A time filled with food and fun, learning and games, and ...embarrassing moments! The Garden Spot FFA Officers invited all “greenhands” to an Initiation Night on October 24 at 6:30 pm in the Veterinary Science Room at Lampeter-Strasburg High School. What is a “greenhand,” you ask? A Greenhand is a first or second year member in the FFA. These are the newest, “greenest” members in our organization this evening was an interactive, exciting introduction to all that the FFA has to offer. 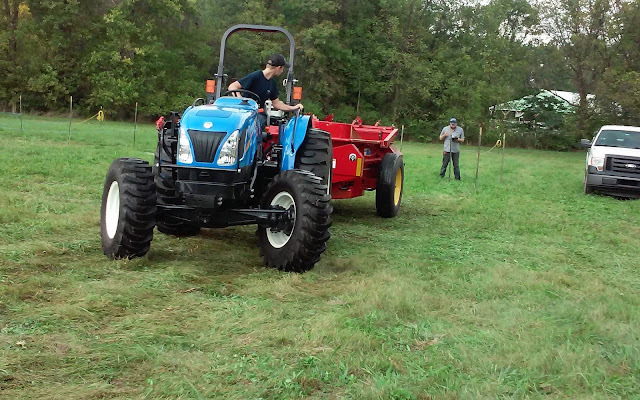 For the majority of the Garden Spot FFA Greenhands, this is their first encounter with the basics of FFA. The officer team lead stations that covered topics in the following areas: degrees and awards that members can receive in the FFA, the components to FFA official dress, how to tie a tie, the expansive list of Career Development Events (CDE’s), the FFA Creed, the FFA Motto and the FFA emblem. Athletes talk of giving 110 percent. Imagine having to give 133 percent. 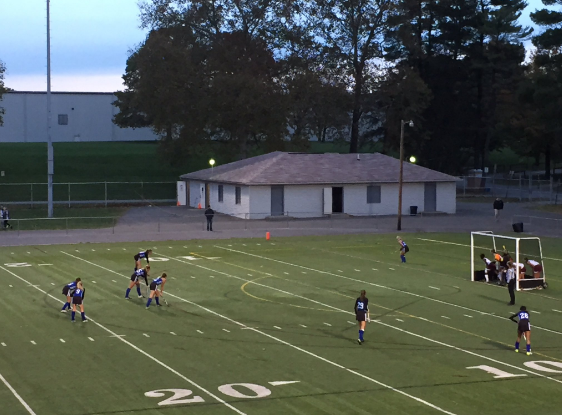 That's exactly what the Lampeter-Strasburg Field Hockey team did on Wednesday in their 80 minute match against Big Springs in the first round of District 3 tournament play. Here's the Pioneers celebrating the win! For the uninitiated, a field hockey match typically lasts 60 minutes with two 30 minute halves. At the end of the second half, the Pioneers stood tied, 1-1 with the Bulldogs thanks to Josie Weaver's first half goal. It wasn't until Abby Thorius hit a corner goal with a 10:30 left in double overtime to give field hockey the win, 2-1.
Credit for the victory also goes to L-S goalie Autumn Peters who proved her mettle by stopping 11 shots on goals. L-S plays again on Saturdayat 3 pm in the next round of the tournament against third-seeded Twin Valley. 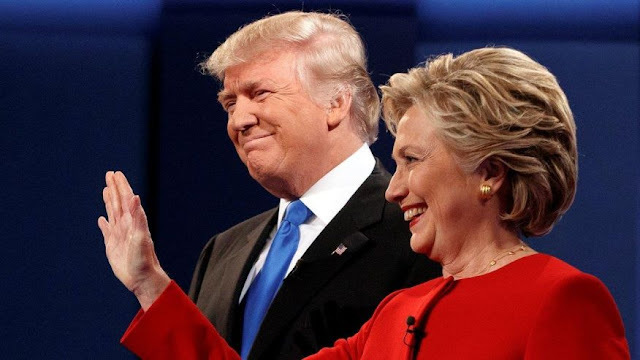 Because Pennsylvania is one of the three most influential swing states in presidential elections, both campaigns have visited on numerous occasions. I was fortunate enough to have seen Mike Pence at the Lancaster Host Resort in August, but it wasn't until this month that I actually saw the Republican nominee. 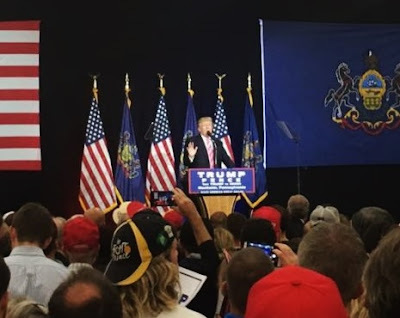 On October 1, Donald Trump held a rally at the Spooky Nook Sports Center in Manheim, and I attended the event with a few friends of mine who are far more supportive of Trump than I am. We spent five and a half glorious hours standing in line. Once we entered the area in which the rally would take place, we waited another hour for the event to begin. Lloyd Smucker, Scott Martin, and Otto Voit each spoke about the threats facing our country and why we have an obligation to elect Republican candidates in all levels of government. If you only saw the final score of the Lampeter-Strasburg vs Elizabethtown game then you don't know just how close of a game it was. The Pioneers dominated the first half of the game with L-S scoring twice. Both Jon Jones and Cam Niemeyer enjoyed touchdown passes from quarterback Todd Shelley. However, the tide shifted for the Pioneers as the Bears took control of the game from the opening of the third quarter and never let go until the very end of the game. With only two minutes left in the game, the Pioneers found themselves trailing by six after a difficult second half. With only 45 seconds left on the clock, Shelley connected with Shane Lawler for a 14-yard reception to give L-S the victory, 31-30. Extra You can vote Todd Shelley as the L-L League Week 7 Player of the Week. Click here. Todd Shelley, QB, Lampeter-Strasburg – Shelley totaled three scoring passes to lead the Pioneers over Elizabethtown in a 31-30 thriller. If you entered Lampeter-Stasburg High School this past week you may have noticed the tractors sitting out by the office. 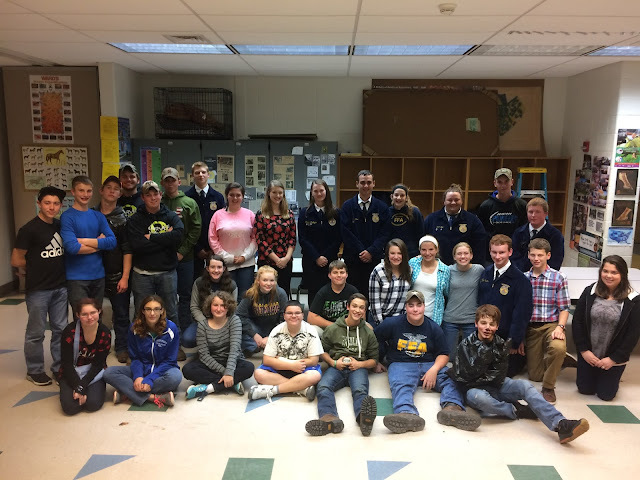 This was in honor of Pennsylvania Ag and Food Careers week (October 10-15) which the Garden Spot FFA chapter hosted with the theme of "Pioneering Career Connections." 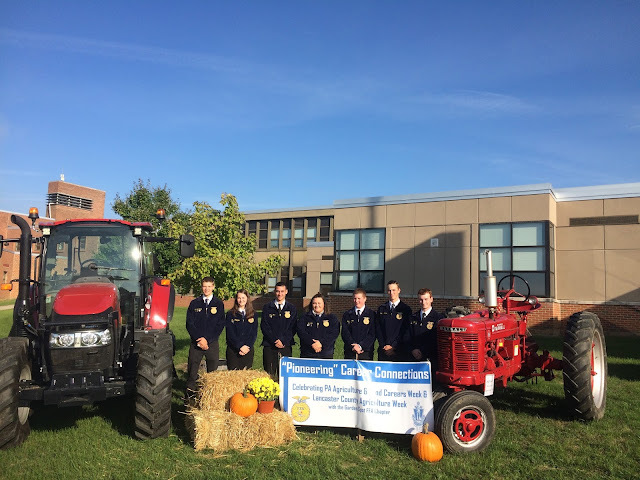 Lampeter-Strasburg was one of four schools in the state selected to hold this event which guests included local businessmen, graduates, school officials, state FFA officers, and local Representatives. At 10:30 on Wednesday, October 12 the presentations got underway starting with opening remarks from Neil Fellenbaum (Pennsylvania Association of Agricultural Educators) followed by Garden Spot FFA’s President, Connor Ranck, and Dr. Kevin Peart (L-S School District Superintendent). When you get injured, it is easy to see. Crutches, braces, or a cast make it plainly visible. This visible injury automatically invites sympathy and support. Recovery is usually as straightforward simply requiring time and possibly physical therapy. But what happens when the pain is in your mind? These less obvious pains do not typically receive the same level of sympathy and support as a physical injury making the healing process more difficult. Many of today's youth struggle with adult problems such as anxiety, stress, grief, and loss. To combat this the guidance office is currently forming student support groups. Support groups bring together students facing similar issues in order to share experiences and learn new skills. These groups will meet during flex over the course of several weeks. Current topics are Grief & Loss and Managing Anxiety & Stress. Students are encouraged to stop by the guidance office to learn more about these opportunities. You are sitting outside on a nice Fall day watching all the clouds in the sky, sounds pretty nice, right? Wrong. All of a sudden you feel little drops of rain running down your face, some might ignore them but others get quite frightened by this. “Why?” you ask, the answer is simple. Phobias are types of anxiety disorders that are defined by a persistent fear of an object or situation. If you look up “phobias” you would come across hundreds of them, all of which were reported to psychologists. It is known that most fears are learned other than the few that make sense such as falling or loud noises. A person who has a phobia would go out of their way just to avoid it. Today 2007 Lampeter-Strasburg graduate, Matt Marafioti, visited the high school as a guest speaker in Mrs. Cathy Lynch's family and consumer science courses. As an added bonus, he drove his food truck. Marafioti is the proud owner of Mara-Leo’s Italian food truck. Nationally, owning a food truck is a popular trend. In fact, new food trucks are regularly popping up all over Lancaster County. As exciting as the lifestyle appears, it's a lot of hard work. However, for Marafioti its a labor of love. He talked to the tenth graders about how he got started as a food truck driver, what he does, and all the work it takes to complete the licensing to operate a food truck. One of Lynch's student's James McMichael enjoyed a meatball sub, saying, "It was awesome." To find out where you can try some of Marafioti's traditional homemade Italian favorites, visit his Facebook page. The start of school is always a busy time for the Garden Spot FFA chapter at Lampeter-Strasburg High School. Members are getting settled into school, preparing their animals for the fair, competing in sports, and much more. Like millions of Americans on September 26, I tuned into the first presidential debate at Hofstra University. I rightly assumed that Hillary Clinton would repeat many of her talking points from the campaign trail. However, it was anybody's guess as to how Donald Trump would do. I couldn’t help but to hope that he would hold Hillary Clinton accountable to all the horrible things she has done in her political career. Instead, he made her seem like the obvious choice to lead our country. The first half hour of the debate was focused on the economy. While Hillary Clinton argued for higher taxes, Donald Trump argued that negotiating better trade deals is a necessity. He said that, as president, he would tax people who make their products overseas and sell them in the United States. This, according to him, would provide incentive for them to make their products here. 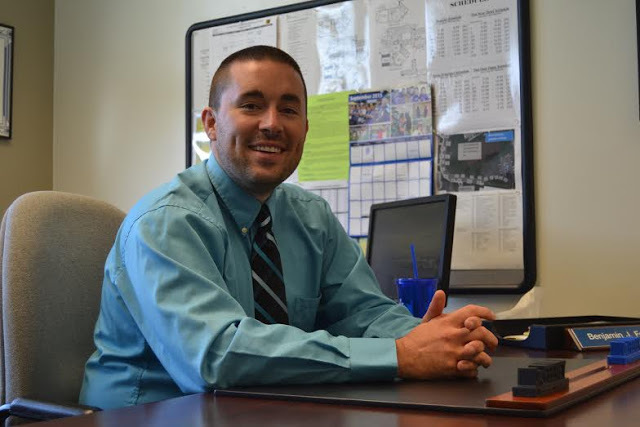 On July 1, Dr. Benjamin Feeney took over as head principal of the Lampeter-Strasburg High School after spending two years as assistant principal. But the real excitement of the position did not start until the student body arrived on August 24. Dr. Feeney replaces Mr. Eric Spencer who after five years as principal elected to return to his first love of coaching football and being a classroom teacher . Becoming principal was not the only exciting event of Dr. Feeney's summer, though. Unbeknownst to most, he went on a Class IV and V whitewater rafting trip in Ohiopyle, Pennsylvania with a group of friends. As if that was not thrilling enough, his raft flipped over and sent everyone into the Class IV rapid. Only time will tell if falling into class IV rapids or being a high school principal is more intense for Dr. Feeney.